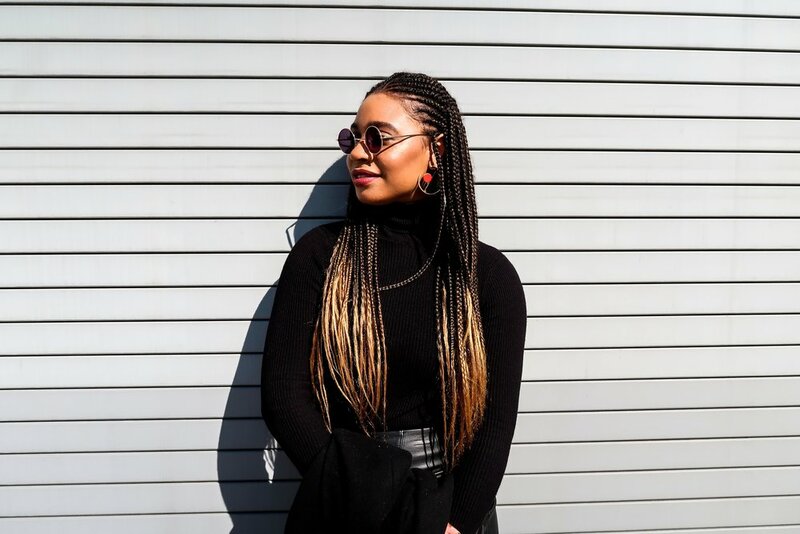 Intro Blog Lookbook Trends Designer Spotlight Shop My Looks! When the word monochromatic comes to mind, one might think of all black, or black and white, but monochromatic looks can also achieved by mixing different hues within the same color family. A head to toe, all black look is definitely my go-to uniform, but these past years I’ve been challenging myself to shop less and style more. Meaning work with the clothes I currently own (because I own quite a lot). This has caused me to get a bit creative with my outfit pairings, so I wanted to show you a few of my latest favorite monochromatic skirt combos! If you’ve seen my Terracotta trend board, then you know that I’m absolutely in love with this color trend. Notice that each component of this fit, from the jacket & tee, to the top & boots, is a different hue within the terracotta color family. The objective is to add dimension to your look, but avoid being matchy-matchy. When I saw Tracey Ellis Ross’ InStyle Cover last year, I knew I had to try a monochromatic rust look of my own! Crafting this look took no time because I used pieces that were already in my closet. This is the perfect Fall/Winter look for my Cali West Coasters & my fellow Southerners, who can sometimes experience multiple seasons within a 12-hour timespan! I’ve totally been on board with the whole jewel tone trend, and the teal tones within that trend. I’ve always been a fan of the shade teal, so I’ve had this color covered within my wardrobe; however, now as this trend continues, I’ve been working on adding different textures of these tones. Mixing textures, in addition to mixing hues, is a great way to avoid being mistaken for a smurf! The hat & boots are faux suede, the top is brushed cotton, while the skirt is satin. Topping this ensemble off with my camel trench, adds contrast to the look without totally subtracting from the monochromatic motif. After trending on runways, interior design, and even cosmetics, grey has now become a new modern-day neutral. 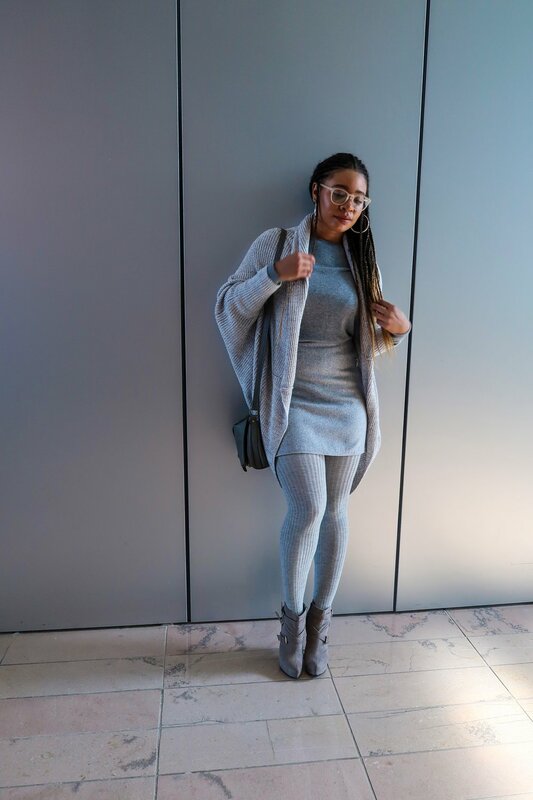 I love neutrals, so over time I deemed it necessary that I had grey covered in every aspect of my wardrobe: tops, bottoms, shoes, outerwear, & accessories. Doing so, made pulling this look together a piece of cake! Again, notice that every component of this look isn’t necessarily the exact same shade of grey. I’m mixing textures, but the rib texture in the sweater is also consistent with that in the tights! I wouldn’t be me if I discussed monochromatic looks without including black! I practically wear black everyday to work (because I’m lazy & no guesswork). I usually accent my black with a pop of color or a print of some sort, in this case my earrings and tote are the accents. 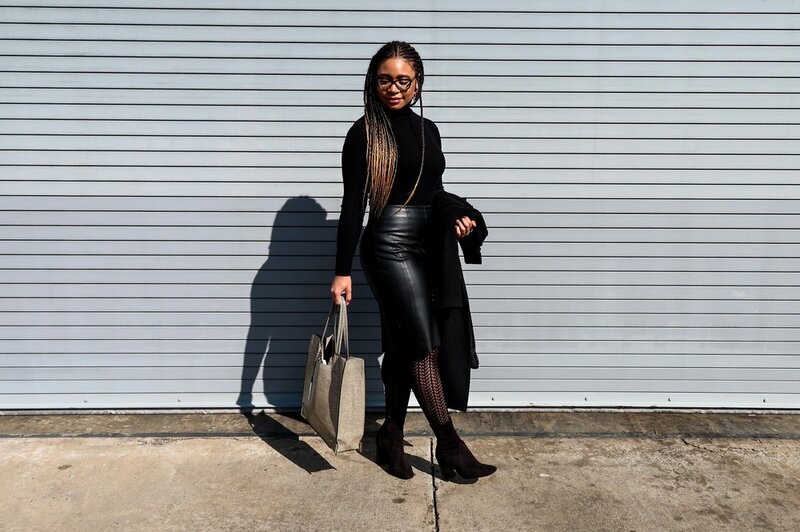 Remember mixing materials & textures create a bit of juxtaposition by breaking up the monotony of the all black: hence the textured tights, with the turtleneck and leather skirt pairing. The textured tights add far more appeal to this pairing, than a solid pair of tights would. This same juxtaposition can also be achieved with combos such as, leather & lace, fur & leather, or even solids and patent leather. Try sprucing up your solid looks by mixing multiple materials within the same ensemble! In my opinion, monochromatic ivory looks exude sophistication. As previously stated, my wardrobe has got the neutrals on lock, so this look was a no brainer for me! I almost decided to accent this look with a pop of color, but I opted for one of my favorite prints instead: leopard! Try not to mistake ivory for white. Ivory is such a season-less color that can be worn year-round, and compliments almost every skin tone. While ivory pieces create pure, classic monochromatic looks, ivory can also act as a contrasting accent. The possibilities are endless, so if your wardrobe is lacking ivory, you should definitely think about adding it! I hope I inspired you to create some monochromatic magic of your own! If I did, feel free to tag me when you post your looks! Which monochromatic look was your favorite?! Which was youR least favorite? Let me know, in the comment field below!